UNITED NATIONS, May 25 2017 (IPS) - The world will not be on track to eradicate poverty by 2030 if current growth trends continue, a UN task force found. The Inter Agency Task Force, comprising over 50 international institutions, launched a report assessing progress on the Addis Ababa Action Agenda, a global framework on development financing to help implement the internationally agreed Sustainable Development Goals (SDGs). Though there has been some progress in development financing, slow global economic growth and decreased trade and investment growth since the 2008 financial crisis has hampered progress on the SDGs, including the eradication of poverty by 2030. “Despite expectations of improved growth in 2017 and 2018, the current global environment bodes poorly for the achievement of the SDGs,” said Under Secretary-General for Economic and Social Affairs Wu Hongbo. In 2016, the world economy grew at its slowest rate since the crisis and the global GDP is projected to grow at less than 3 percent over the next two years. Such rates are likely to leave almost 7 percent of the world’s population extremely poor by 2030. Least developed countries (LDCs) will fall the farthest behind, Hongbo stated. Though the number of people living on less than 1.25 dollars per day has decreased dramatically in the last few decades, the decline largely relied on strong economic growth in developing countries, the report notes. Low economic growth is also contributing to rising levels of unemployment. The International Labor Organisation estimates that there will be 3.4 million more unemployed people in 2017 than in 2016, and further increases are expected in 2018. The UN Conference on Trade and Development’s (UNCTAD) Director of the Division on Globalisation and Development Strategies Richard Kozul-Wright noted that these trends are partly due to the failure to develop sustainable growth strategies. “A lot of people expected that the post financial crisis that there will be a serious reflection on the kinds of growth strategies forged prior to the crisis which were clearly unsustainable and not inclusive, but that hasn’t really happened,” he said. Weak investment is another major challenge hindering the achievement of the SDGs and thus growth, he added. Between 1 and 5 trillion dollars of additional investment is needed for infrastructure alone, a key element to help sustain growth in developing countries. Transportation infrastructure enables trade and economic development, which is particularly important in land-locked developing countries, while energy-related infrastructure is essential for climate change mitigation and adaptation. However, public and private infrastructure investment has declined globally. Though official development assistance (ODA) increased by almost 9 percent in 2016 from 2015, escalating humanitarian needs have led to significant short-term and long-term financial gaps. Uncertainty in key policies of major countries only heightens risks in the global economy, including the U.S.’ proposals to cut foreign aid and climate finance. Hongbo noted that the creation of national policies that align with the SDGs as well as international cooperation to boost sustainable and inclusive growth is crucial. “Many of the challenges that countries face, including slow economic growth, climate change, and humanitarian crises, have cross-border or global repercussions and it cannot be addressed by any one actor alone,” he stated. The launch of the report coincided with the second annual forum on financing for development which brought together member states and international organizations to discuss the pressing issues laid out in the report and its potential solutions. Participants reached an agreement on SDG financing, calling on governments to increase and adhere to their ODA commitments and improve tax policies, including international efforts to fight tax evasion, while urging development banks and private sector actors to help mobilize catalytic resources. 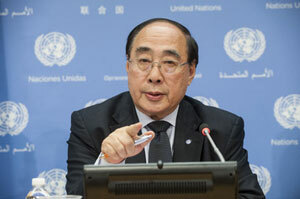 “We will have our voice heard whenever we can, we will speak loudly for the LDCs and the vulnerable countries and its people,” Hongbo concluded. Blaming a lack of growth encourages capitalism.